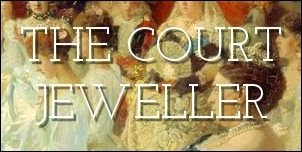 We've talked at length here at The Court Jeweller about the Cambridge emeralds, the magnificent set of emerald jewels that came from Queen Mary's family and now make up a central part of the British royal collection. But there's another diamond and emerald necklace in the family vaults: one that was once thought to be a part of the great jewelry collection of the Duke and Duchess of Leuchtenberg. In 1965, a pair of elderly sisters, the Godmans, approached Buckingham Palace and told them that they had a piece of jewelry that the Queen might be interested in. According to Leslie Field in The Queen's Jewels, they believed that a diamond and emerald necklace that they'd inherited from their father, British Museum trustee Frederick McCann Godman, had connections to Empress Joséphine of France. The story went that Frederick Godman had bought the necklace in the 1890s during a trip to Bavaria. From our discussions of the jewelry collection of Joséphine of Leuchtenberg, we all know that Empress Joséphine's only son, Eugène de Beauharnais, married Princess Augusta of Bavaria in 1806. The astonishing jewel collection of Eugène and Augusta, who were later given the titles of Duke and Duchess of Leuchtenberg by her father, the Bavarian king, contained many pieces that had genuine links to the French imperial family. The palace did a bit of digging about the Godmans' necklace, and unfortunately, it was determined that the piece didn't come from Empress Joséphine or the Leuchtenbergs at all. Regardless, it's an extremely beautiful nineteenth-century necklace, and the sisters asked if the Queen would still like to have the piece. It's rare that the royals accept such extravagant gifts from the public, but as in the case of the Queen Mother and the Greville inheritance, this time the Queen accepted. Since then, the Godman necklace has made occasional appearances around the Queen's neck at various state occasions. It's been gathering dust in the vaults for over a decade now, though; it was last worn in public at a state dinner for President Chirac of France in 2004. Here's hoping it comes out again soon -- I think this piece would be especially lovely on the Duchess of Cambridge.